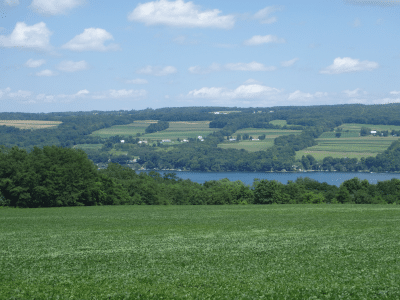 The watershed of Owasco Lake, a New York Finger Lake, extends over a 200-square-mile region that is predominantly agricultural. The lake serves as public water supply for about 44,000 people located in the City of Auburn and neighboring municipalities. EcoLogic was Cayuga County’s lead consultant in developing the watershed management plan, released in 2016. To complete this assignment, our staff conducted an inventory of Owasco Lake and its watershed, and we examined the effectiveness of local laws, programs, and practices in protecting the lake and watershed. We solicited public input through surveys and focus groups, and we incorporated input from the county’s multiple collaborators—including more than a dozen municipalities, nonprofit groups, partner agencies, and institutions. EcoLogic guided the development and prioritization of recommendations presented in the published plan. Visit Cayuga County’s Owasco Lake website to read the inventory report and the Owasco Lake Watershed Management and Waterfront Revitalization Plan. In 2017, the county hired EcoLogic to supplement the plan with updates designed to meet state and federal requirements for a Nine Elements Plan.